Attached are the settings I have right now. 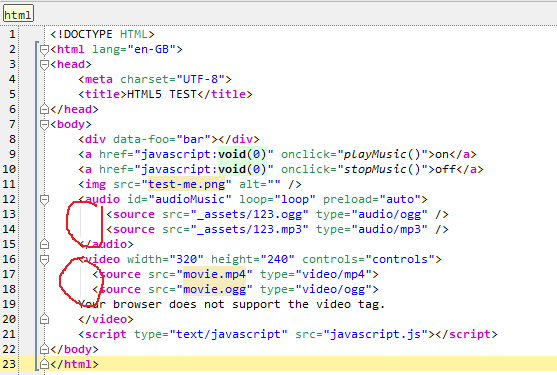 I don't see any vertical indent, and no auto completion as shown in the result image. I'm new...so any help is appreciated. I'd just created this as a new project. So, I don't think the other thread's method of removing .idea will work for me. 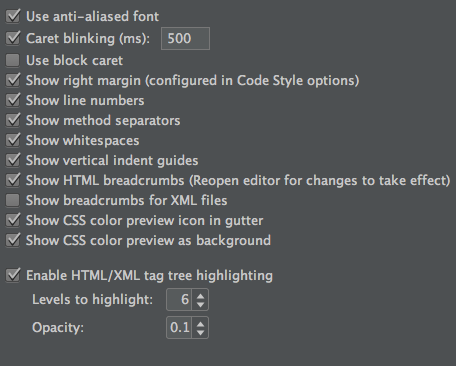 Just to add I do have View->Active Editor->Show indent guides turned on. I have no idea why Code Completion popup does not automatically appears for you -- should work with your settings. I may only suggest setting some small delay (e.g. 50 or so) and see if it will make any difference. You can always invoke it manually (Ctrl+Space by default). I, personally, always invoking it manually (as it not poping up in-my-face when I do not need it). I did try Ctrl+space to manually trigger autocomplete, but it says no suggestions. Only local variables work. 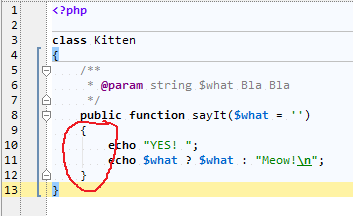 It has to be in within that function. Attached a screenshot when where I change the code style. Even that preview window doesn't show the vertical indent guides. Weird. Worse case I'll just try reinstalling it. Update: Autocomplete now popups up automatically after I disabled Power saving mode. I think I turned it on to ease the memory usage but forgot to turn it off. Indent lines appeared too. However, autocomplete is still limited by scope. Well as least thats down to one issue and I think could be due to some settings too. 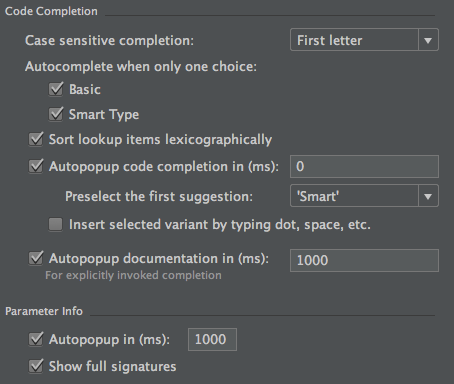 Update: So this actually works (http://blog.hwarf.com/2011/08/configure-phpstorm-to-auto-complete.html). But I'm not keen to add all those comments just for autocompletion to work. Is it possible to have autocompletion work based on the text in the current file? So .. you are working with CakePHP framework, right? All those models etc are defined via magic methods/dynamically. PhpStorm with it's static analysis cannot find such magic declarations since it does not have special support for any of the frameworks (some of such fields/methods are created during runtime from config files .. or even directly from DB). That's why @property, @method PHPDoc tags exist in first place -- and you can use them to desribe your "magic" fields/methods there. There is nothing wrong with this -- magic comes with a price of manually providing such hints, unless IDE (any IDE) has special support for this *specific* framework.